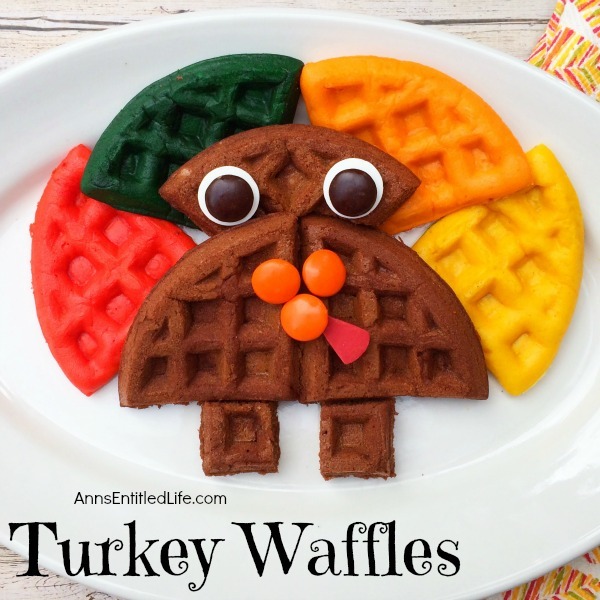 This adorable turkey waffle makes for a wonderful Thanksgiving breakfast! Your kids (and you) will be thrilled to start the day with this sweet and charming morning repast. • Flag Waffle Recipe – this is a fun, easy waffle recipe you can make for the Olympics, Patriotic event days, etc. And these “patriotic”o9 waffles are a great combo of fruit, waffle, and tasty whipped cream – definitely fun and simple to make. • Easy Jack-O’-Lantern Waffles Recipe – A fun fall breakfast, this Jack-O’-Lantern Waffles Recipe is easy to make and delicious! 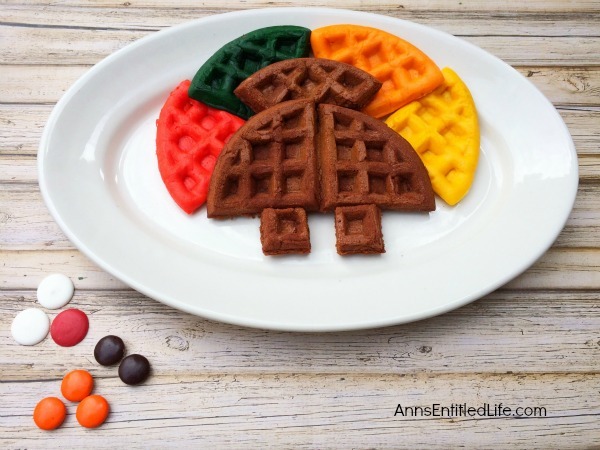 • Christmas Tree Waffle Recipe – Christmas morning breakfast does not get any cuter than this Christmas Tree Waffle! Your children (and you) will be delighted with this yuletide morning repast. • Combine flour, sugar, baking powder, cinnamon, and salt in a medium sized mixing bowl and blend together. • Add in egg, milk, and oil; mix well. 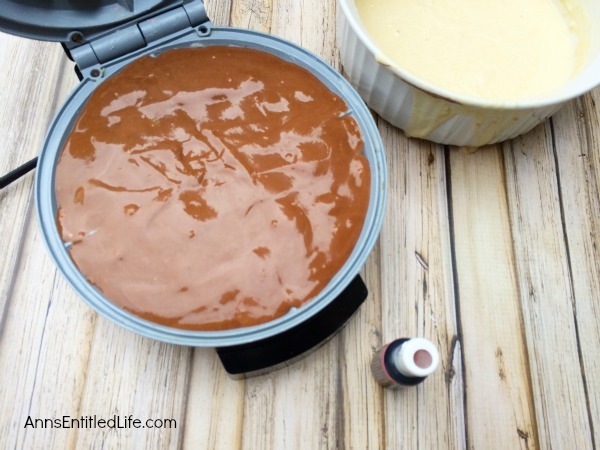 • Scoop half your batter into a disposable cup (easy clean up) and mix with 2 drops of brown food coloring. 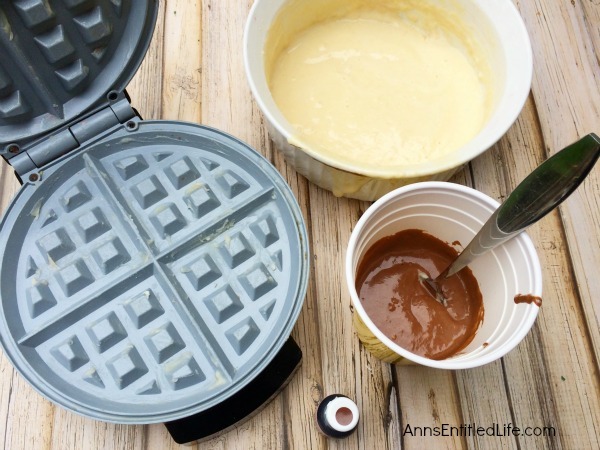 • Pour brown batter into greased waffle maker. • Cook on medium heat until timer/light goes off. • Unplug waffle maker and carefully remove the waffle. • Separate your remaining batter into 4 cups. • Into each separate cup drop one drop of each different food color – red in one cup, green in another cup, yellow in a third cup, and orange in the fourth cup. Mix each cup. 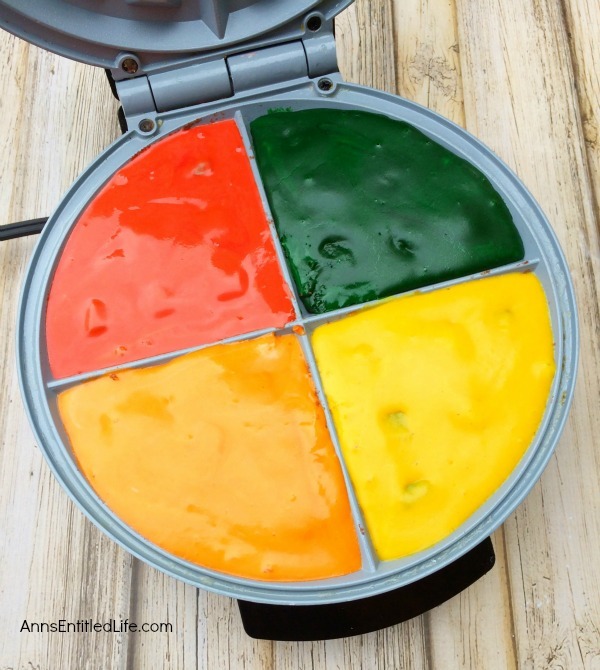 • Carefully pour one colored batter at a time into each quarter of your waffle maker (each triangle) making certain not to overfill over the quarter marks. 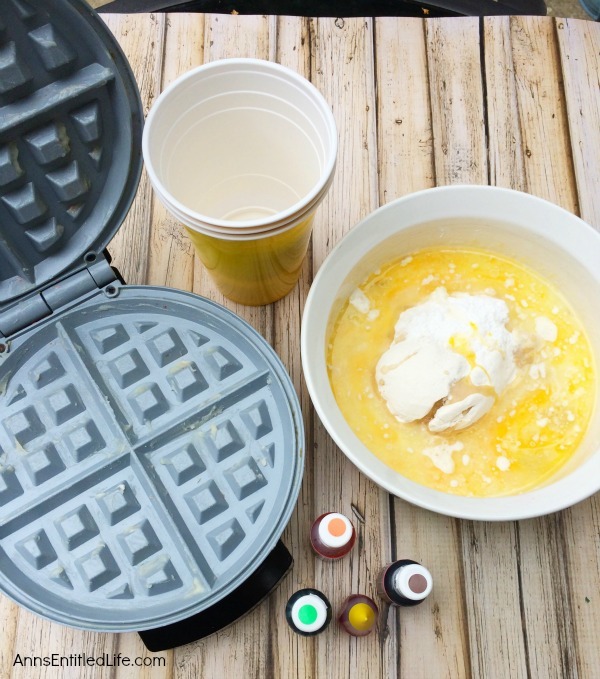 • Unplug your waffle maker and carefully remove the waffles, they should come out in four separate pieces. • Cut your brown waffle in half and place round side up on your plate. • Cut your remaining waffle piece in half and cut a rounded piece off the point to use for the turkey head. • Now cut two squares from the last waffle piece to use for turkey feet. 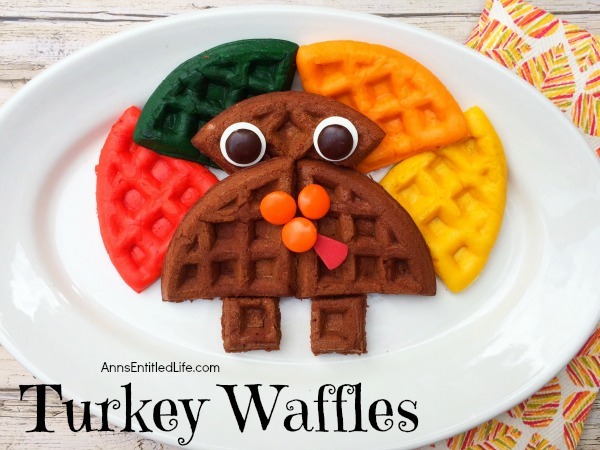 • Place the colored triangle waffles around the turkeys head, with the points facing down. • Add 2 white candy melts with brown mega M&Ms on top for the eyes then place on the turkey’s head. • Break off the sides from one red candy melt, smooth the edges with your finger and place by the beak. • Isn’t this adorable!? 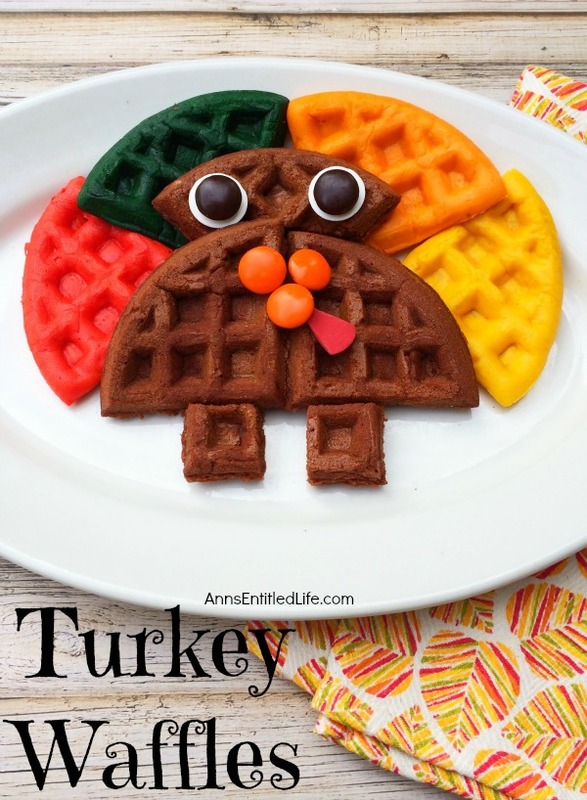 Your kids (grandkids, you) will be thrilled to start Thanksgiving morning with this super cute Turkey Waffle. • To print the Turkey Waffle recipe click here. This will be the cutest breakfast for Thanksgiving! 🙂 Visiting from Live Laugh Rowe – pinning! Hope you’re having a happy week!